Red Copper™ Better Pasta Pot™ | Official Site | Just Cook, Drain, And Serve! The handles stay cool and easy to hold while the lock-on lid makes it so easy to drain! No more spills! The Better Pasta Pot is great for cooking large meals for your family, no need for multiple pots. Straining pasta can be such a pain. Boiling water splashes everywhere and steam can burn - ouch! Then your pasta spills out of your colander. What a mess! Not anymore. The Red Copper™ Better Pasta Pot™ is a revolutionary pasta pot that allows you to drain water easily without the mess. READ FULL DESCRIPTION The secret lies within Red Copper™ Better Pasta Pot™'s lid. Made of tempered glass, the lid doubles as a strainer. The large 5 quart pot has easy lock handles so the lid stays in place. Just lift to lock! Large holes on one side of lid allow you to drain foods like pasta, ravioli, and potatoes. Smaller holes on the opposite side are perfect for straining small vegetables and draining grease from browned ground beef. Red Copper™ Better Pasta Pot™ is infused with pure copper and is coated with Anti-scratch Technology so you can boil and mash your potatoes all in the same pot! The non-stick ceramic surface means the Red Copper™ Better Pasta Pot™ is easy to clean. Never scrub sticky mac n' cheese from your pot again! Eliminate the need for using a separate colander and large pot. 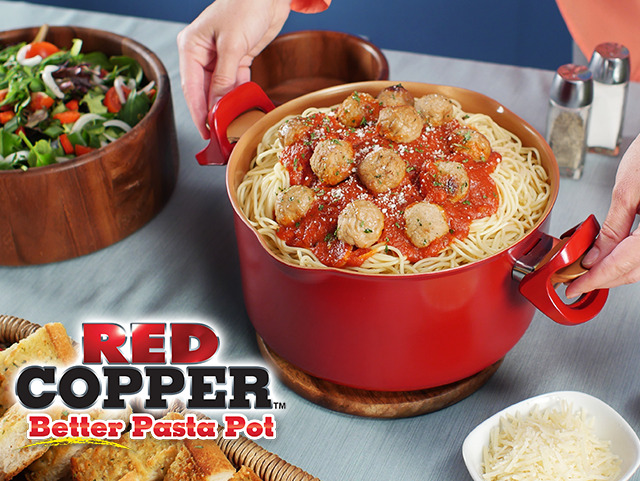 Red Copper™ Better Pasta Pot™ is your one-stop pasta pot that cooks and drains. To celebrate over 1 million Red Copper™ cookware sold, we will be offering the Red Copper™ Better Pasta Pot™ with tempered glass lid at a special half price for only $19.99 plus $9.99 shipping and handling! You will also get Cathy Mitchell's recipe book. Want more bang for your buck? Double your offer and receive the Veggetti™ spiralizer - just pay a separate fee of $14.99. This special offer won't last long so order now! Tempered glass Lid locks on tight - just lift, lock, and drain! Add the fry basket to turn your Better Pasta Pot into a 5-quart deep fryer! Hear from other Red Copper™ customers how much they love it, and why you will too! Check out all the news for Red Copper™ Better Pasta Pot™ and its creators featured all over the world.